On Wednesday 27th last, we were delighted to welcome Chris Young of the Irish Chilli Farm to the cookery school as our first Slow Food guest of 2016. Our good friend Camilla Plum also "dropped in" to say hello and bring us some of her own wonderful varieties of chillies from her farm in Denmark. Chris Young's story is an interesting one. He and his wife decided to leave behind their respective careers in the motor and computer industries in London to move to Ireland and start a new chapter in their lives. Having bought and renovated a beautiful property known as Castle Sheppherd House (otherwise known as National Monument #47) in North Tipperary, they looked at the land accompanying the house and started to consider how they might make a future living from it. No-one was growing chillies commercially in Ireland at the time, and so they thought, why not give it a try? Today, they are producing 15 different varieties of their own chillies and are involved in the production of a chilli porter with the happening N17 Brewery. They made their first sales of chillies through the Milk Market in Limerick, initially anticipating a local market for just the milder varieties. They were pleasantly surprised when requests started rolling in for hotter and hotter chillies, eventually attracting a customer for the somewhat terrifying Hot Chocolate Habanero, complete with skull & crossbones packaging and an accompanying pair of gloves - not for the faint-hearted! In the footsteps of NASA, Chris starts his chilli seeds under strips of coloured lights before planting them out. Blue light is beneficial to the growing leaves, while red helps the flowers to come into bloom. He plants them in slightly acidic, reasonably well-draining soil and feeds them with a mixture of comfrey and nettle teas which are bursting full of nitrates and phosphates. Pest control is achieved through the use of a home-grown garlic spray, and they are watered with collected rainwater. He then recommends freezing a surplus of chillies by blending a number of varieties and pouring into ice-cube trays for use at a later time. 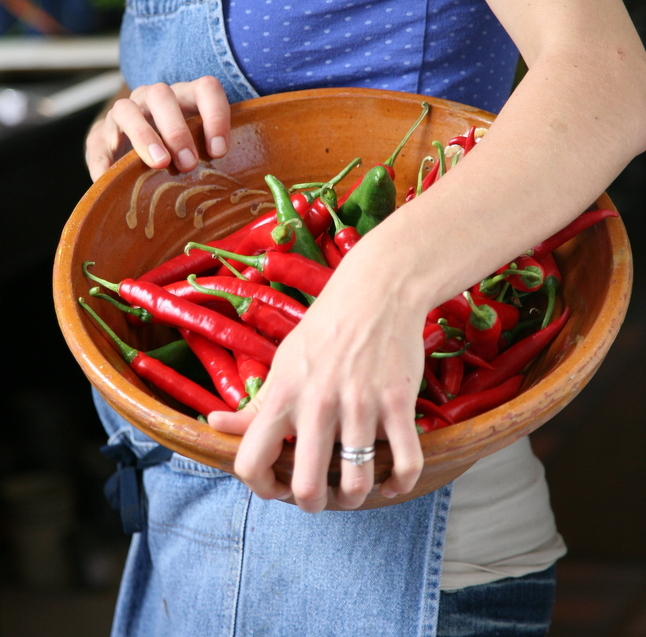 He also favours drying chillies for chilli flakes, combining flakes and salt in a 50:50 mix for a delicious seasoning. A preferred preserving method includes cold-smoking his chillies using peat to lend them a uniquely Irish flavour! By 2017, the Irish Chilli Farm will be producing an astounding 100 kilos of chillies per week! They are currently supplying to retail outlets nationwide as well as the restaurant trade, and have significant plans to scale up distribution in the coming year. Thanks to Chris for such an enlightening lecture, to Camilla for bringing packets of chilli seeds for all our guests, and to everyone who attended and made the evening a success. Those chillies with the brown marks? They're the good ones!